This tool is free for you to use. Watch the video below and see how the Myopia Calculator works and some of its features, hope you enjoy this exciting new product. 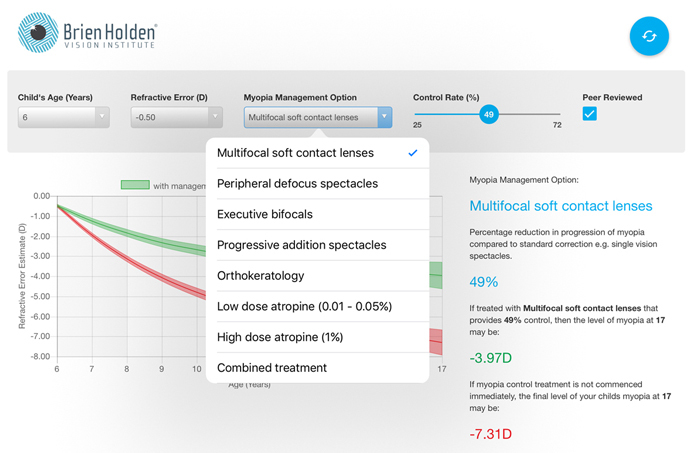 Management Options: Choose from different myopia management options, including: multifocal soft contact lenses; peripheral defocus spectacles; executive bifocals; progressive addition spectacles; orthokeratology; low and high dose atropine. Peer Reviewed Data: All data is sourced from peer-reviewed reports on well-conducted clinical trials. Control Rate: Use the ‘control rate (%)’ slider to change the level of myopia control and view how it will impact on progression of myopia across the range reported for the selected treatment, compared to standard correction, e.g. single vision spectacles. Responsive: Although the calculator is created primarily for desktop and tablet use in your practice, the responsive design ensures it will perform on all devices (including smart phones). An interactive webinar, presented by Dr Monica Jong, on Tuesday 21st November at 6:30pm Sydney time, 8:30pm NZ time. A recording of the webinar will be available afterwards (watching recording is worth 2 independent learning points for Australian optometrists). Managing Myopia is divided into 2 modules: Risk Assessment and Myopia Management. The course is CPD certified for Australian optometrists (10 points in total, including 3 face-to-face points and 1 therapeutic point). Points will be allocated for each session completed, up to a possible total of 10 points. NZOA CPD certification is pending. After you have paid and secured your place for the course, the course will begin 9am, Monday November 6th, 2017. The price of this course includes GST. Padmaja has been researching myopia for over 10 years. Padmaja has over 50 articles in peer reviewed journals, has authored chapters in books and has delivered many podium presentations. In addition, she is also involved in post graduate supervision and manages the Intellectual Property portfolio of the Brien Holden Vision Institute. Recently, she and her co-authors were awarded the Garland W. Clay award by the American Academy of Optometry in 2013 for the most cited research article in the journal Optometry and Vision Science for their work on myopia. Monica has also co-supervised graduate students and co- authored a number of scientific papers, and speaks regularly at global scientific and practitioner meetings.. Professor Smith, who is the Dean and Greeman-Petty Professor at the University of Houston’s College of Optometry, has changed our understanding of the factors that drive myopic growth, determining that the development of myopia is largely controlled by the peripheral retina, rather than the central retina. His primary research interests are focused on the optics of the eye, especially on the environmental and physiological factors that influence the eye’s refractive status..
Alex lectures in ocular disease and therapeutics, and his research focuses on the development and testing of novel ways to treat ocular diseases. His peer-reviewed publications include utilising contact lenses as a means to deliver pharmaceuticals to the eye. His other research interests include development of drug delivery systems for the treatment of diseases of the eye, including development of new eye drops and biomaterials, as well as the use of atropine for the treatment of myopia. Isabelle is the author of almost 50 refereed papers and several book chapters. As a Senior Lecturer in Optometry and Vision Science, she teaches ocular diseases and ocular therapeutics. Her research interests include anterior segment diseases, contact lenses, and public health optometry. She is also an internationally recognised pioneer in the field of evidence-based practice in optometry. Pauline's research focuses on optical strategies of myopia control. In particular, she has been exploring optical changes induced by various types of contact lenses to better understand how different contact lenses induce myopia control effects. Her research has also explored changes in visual function, binocularity and accommodation with contact lenses used for myopia control, with the aim of improving efficacy of current myopia control devices. Daniel has published on a variety of ophthalmic topics, including ocular pathology, contact lens case contamination, contact lens compliance, contact lens deposition, contact lens solution compatibility and novel contact lenses for correcting presbyopia and myopia. He has also presented at the American Academy of Optometry (AAO), Association for Research in Vision and Ophthalmology (ARVO) and the British Contact Lens Association (BCLA).